Kids, are You ready to learn about Jesus, have a great time and make new friends?!? 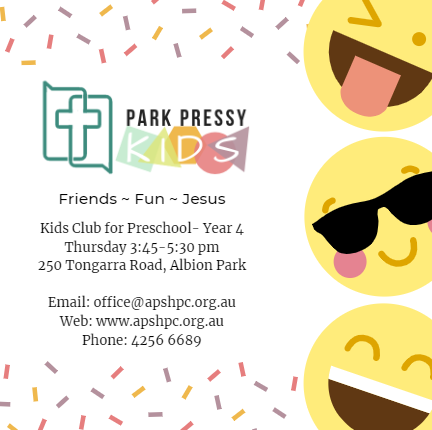 Park Pressy Kids is an exciting, vibrant and joy-filled place for younger children* (Pre-school to year 4) to think about what the Bible has to say and how it impacts their lives. It’s also a great place to have loads of fun and meet kids from all around Albion Park. Kids club will be running after school on Thursdays with Afternoon Tea at 3:45pm. It ends at 5:30pm. Any kids in Pre-school to Year 4 would be welcome to join us! *Big Kids and Youth in Year 5 and above are all welcome at our youth group: Park Pressy Youth. Check it out!